This is one of my favorite pachadi. Here is the recipe for pachadi. First take a pan, fry 1/2 tsp mustard seeds,(given in ingredients) coconut and red chillies to golden brown. Let it cool and grind it into a fine paste and keep it aside. Take a pan, put the pumpkin pieces, required amount of water, turmeric powder, salt and turmeric paste and let it cook for 10 mts. It may take more than 10 mts. for the pumpkin to cook. Let it cook. Now add the grounded paste to it and let it boil for another 7 mts. Now add jaggery and some more water to the pachadi and let everything mix nicely. The required consistency may not be watery or thick. It shold be in between the both. 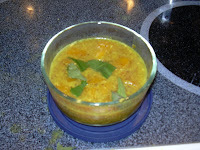 If necessary, mix 1/2 tsp rice flour with 3 tbsp water and add it to the pachadi. take a small pan, pre heat oil, add mustard seeds, when it splutters, add urad dhall and curry leaves and pour it on top of pachadi. This can be a wonderful side dish for kootu rice.